Sony Classical has just released a CD of a recording more famous for being out of print than available: selections from Fromental Halévy's La Juive "The Jewess," recorded in London in 1974, with Richard Tucker, Martina Arroyo, Anna Moffo and Bonaldo Giaiotti. Antonio de Almeida conducts. These were marquee names to music lovers and record buyers in the 1960s and 1970s. They are all heard with great pleasure 40 years later. The LP issue of this recording was considered a triumph for American tenor Richard Tucker (1913-1975), who loved the role of the goldsmith, Eléazar. A devout Jew, Tucker recognized the opera as a great acting challenge, and a chance to excel in a part once sung by Enrico Caruso. The original release sold quite well. It remained in print until 1977. By then, Tucker had died. Music critics have generally never liked La Juive, and it was almost never performed. Revivals began in 2003, with tenor Neil Shicoff. Still, old-timers like me remember Tucker, not to mention Arroyo and Moffo, and the near 40-year absence of this recording from the shops—now all online, alas!—is hard to understand. You kids should buy this, too! Listeners who love Aida or Carmen may be forgiven for having never heard of Halévy (1799-1862) or his best-known opera, La Juive. Halévy, a pupil of Luigi Cherubini, was a musician of impeccable pedigree and good contacts in the musical world of Paris circa 1830. He also had a good eye for a theatrical yarn. Eugène Scribe's bloody story of the goldsmith Eléazar and his foster daughter, Rachel, seemed to be begging for the expensive and huge resources of the Paris opera. The opera is a horrible clash between a Jewish merchant at the mercy of Christian aristocracy, with a young woman trying to live in both worlds and surviving neither. Suffice it to say that Halévy gave his characters some vivid arias, a moving Passover scene and a wild finale, with the leading lady being boiled in oil. And you wonder why you've never heard of La Juive. Not every opera is a masterpiece. La Juive has a huge cast and orchestral and vocal writing that pointed to Verdi. It features magnificent roles for a dramatic tenor, soprano and bass, and pretty good roles for a second tenor and seconda donna. I've never seen La Juive. At the Metropolitan Opera in New York, it was sung by Enrico Caruso the year before his death. Historians call it his greatest performance. La Juive survived Caruso at the Met, with Giovanni Martinelli. After 1936, La Juive had to wait until 1964 for a concert performance in New York starring Richard Tucker, who begged and bullied the Met to present him in the opera to no avail. It wasn't until 2003 that the opera returned to the Met stage, in a seven-performance run with Shicoff. This new-to-CD performance with Tucker presents less than one hour of highlights from an opera that runs nearly five hours (one of the reasons it is seldom performed). Included is Eléazar's moving aria "Rachel, quand du Seigneur"—a great bass aria for a great bass, Giaiotti—and "Ah! que ma voix plaintive," a duet for two sopranos. Arroyo is in her magnificent prime, and Moffo just past hers. This recording of scenes from La Juive, unduly neglected for years, is finally back. It's a souvenir of wonderful opera from a generation ago. And it well represents an opera important to the many great singers who admired Halévy's score. Today is Anna Moffo's birthday. She is an American soprano, born on this date in 1932 in Wayne Pennsylvania. She died in New York in 2006. For those who love singers and vocal music, the annual Richard Tucker Foundation Gala is a banquet veering on gluttony. 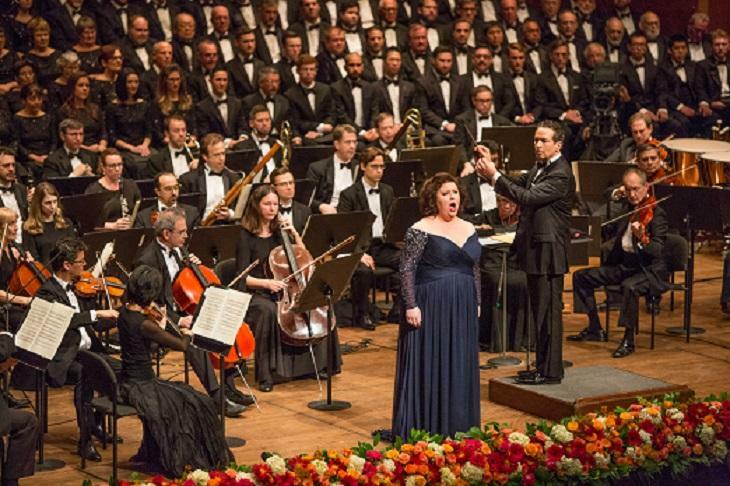 The 2015 Gala, taped last November at Lincoln Center will be shown on WOSU TV Friday, February 5 at 9 p.m. Listen to the latest Opera Abbreviated episode above! The Columbus Symphony Orchestra and Chorus collaborates with Opera Columbus for two performances of Bizet's Carmen in the Ohio Theatre, Friday and Saturday May 9 and 10 and 8 pm. Jean-Marie Zeitouni conducts. This performance will be broadcast on the Columbus Symphony broadcast series May 18 at 1 pm. Carmen! What's not to love. She's comes down to us as a gypsy girl, hands on hip, rose in her teeth, a man killer, a harlot, the nightmare of every boy's Mama.